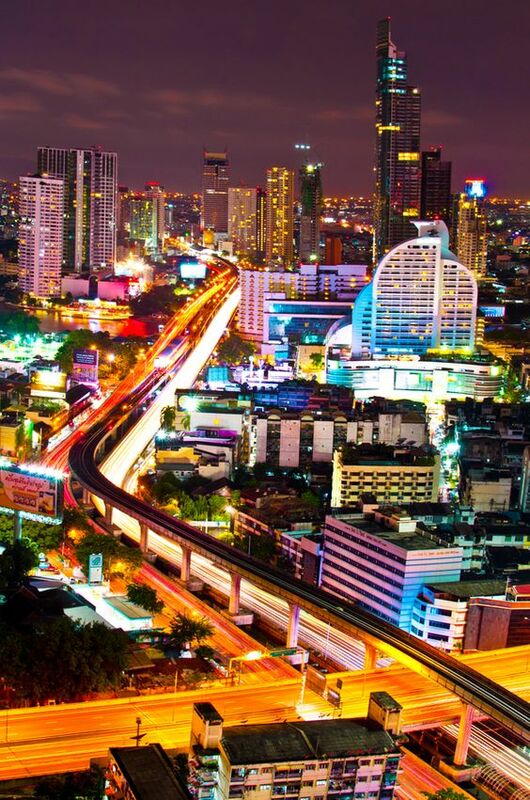 With so many truly stunning tropical Thailand Islands in which to discover and uncover, you would need to extend your vacation or you would almost certainly need to keep coming back time and again to this remarkable Asian country. Although these options are more easily said than done, I have on many occasions, accomplished both due to my passion for travel and in particular my passion for all things Thai. Let's face it, whether you are an outdoor adventurer, a beach lover or a party animal, these beautiful islands around Thailand are such huge travel magnets that you would simply loath to leave. I sincerely hope your passage throughout these island pages will enlighten and inspire you as my journeys did. Please do join me on a Thailand Island Hopping adventure to some of the regions most talked about islands. And while you're about it relaxing around on the pure soft white sand while lazily gazing across stunning crystal clear waters, you can indulge yourself in a vast array of water sports activities too. You could go snorkelling amongst the numerous colourful coral reefs while diving amongst spotted rays, tiger fish and an assortment of tropical marine life. You could even try your hand at deep sea fishing for barracuda, marlin or giant grouper fish. You could go kayaking through the many hidden caves around the islands or try your hand at rock climbing. The opportunities are endless. 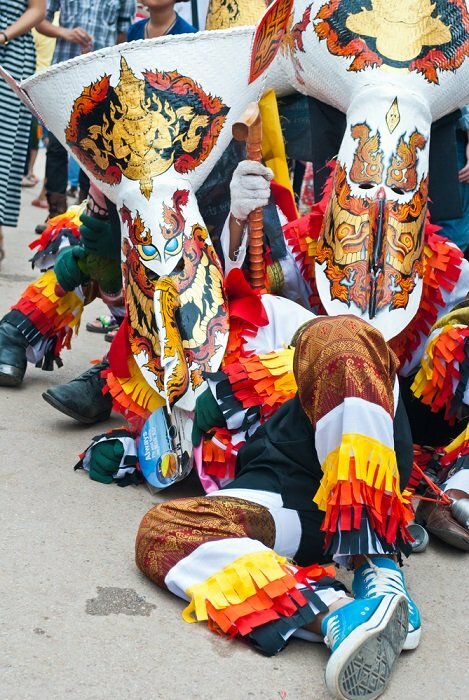 And the fun does not stop here either as there are loads more to do on these idyllic tropical Thailand islands. There are also super parties, fantastic clubs and discos, spectacular cabaret shows, exciting festivals and events, vast amounts of interesting attractions, not to forget excellent restaurants for fine dining and lots more to keep you, your family and everyone else happy and fun-filled. Once bitten, you will want to come back for more so go out there and enjoy yourself. You will not be sorry as it could easily be your best holiday ever. Phuket is the largest of all the Thailand Islands and by far the most attractive beach destinations here. There are beautiful white sandy beaches with backgrounds of lush tropical forested hills and valleys full of coconut groves and rubber plantations. This island also has all the modern creature comforts to make your vacation more memorable. 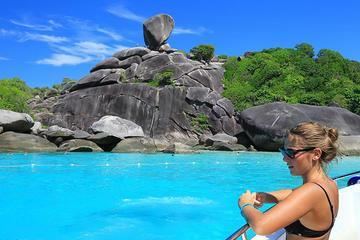 The Similan Islands are positioned in the heart of Ko Similan National Park and about 90 kilometres (55 miles) north-west from the island of Phuket. These magnificent islands, of which there is a total of nine, are rated as one of the top ten dive sites in the world where you can enjoy some of the best scuba diving ever. The turquoise waters, perfectly clear visibility coupled with some amazing underwater marine life and superb scenery, is truly mesmerising. How would you like to go to one of the best dive and snorkelling sites in the world? If you're going to be in this part of the world, this would be a wonderful opportunity for you to take a full-day tour to the Similan Islands National Park. What you'll get is long white sandy beaches surrounded by crystal clear water, perfect for diving and snorkelling. You'll have a full-day speedboat transfer from Phuket and back with lunch and snacks included. Does this sound good to you? Panyi is a fishing village built on stilts alongside a gigantic limestone cliff island and a great stop-over to enjoy local cuisine on offer at the restaurants there. Phang Nga Bay has many hidden treasures. The islands here offer many thrilling insights to some of the most stunning sanctuaries in Thailand. These include the limestone stacks of Koh Khao Phing Kan island and Koh Tapu island made famous by the James Bond film. There are many mighty limestone enclaves on Koh Hong Island and impressive stalagmites and stalactites at Tham Lot Island. If this is not enough, there are eerie caverns containing paintings and discarded seashells left behind by prehistoric man such as those found at Tham Hua Gralok, also known as Skull Cave. An impressive 15 metre-long golden reclining Buddha and a large Chedi containing the bones from a family of ex-local governors awaits you inside Suwan Kuha Cave. Thanbok Koranee National Park is an exquisite region of miniature waterfalls amidst beautiful limestone scenery. If you are in Phuket on vacation, a Phang Nga Bay tour simply has to be on your to-do-list. With only two places in the world quite like it, this one is super special. Our well-designed route offers an excellent opportunity for you to see the most magnificent highlights in an epic landscape of limestone pillars, tiny islands, hidden caves, lagoons and then some. 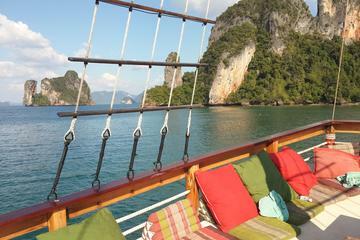 You can relax on the sun deck while we pass many a limestone karst rising 300 metres from the emerald green waters. Also on this tour, we do a beach and swim stop from the boat. Koh Yai Noi is an idyllic island on the edge of Phang Nga Bay almost equidistant from Phuket, Phang Nga and Krabi and offers breathtaking maritime views from every angle. This would be a great getaway opportunity to escape and explore some of nature's true natural beauty while still being able to indulge in activities such as rock climbing, elephant trekking, hiking, diving, kayaking and swimming. 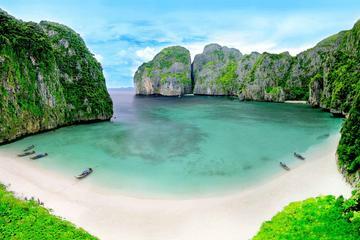 Phi Phi Don & Phi Phi Ley are located approximately 45 kilometres (28 miles) equidistant from both Phuket and Krabi in the southern end of the Andaman Sea. Phi Phi Don is arguably one of the most alluring of all the Thailand Islands due to its dazzling soft white sandy beach, its inviting crystalline clear turquoise waters and its awe-inspiring rocky limestone backdrops. Phi Phi Ley lends itself perfectly to excellent snorkelLing opportunities such as the ones found at Maya Bay and the exploration of sea swallow nests seen in the Viking caves. How would you like to arrive at the Phi Phi Islands early in the morning and avoid the crowds? If that is the case, your day will be rewarded with a stunning view of the magical and famous Maya Bay. On this tour, you'll also get hotel transfers as well as a freshly prepared picnic lunch. All you have to do is to sit back and relax because you're going to have the most amazing day ahead of you. Koh Samui is the third largest of the Thailand Islands. Originally dubbed as having the biggest coconut plantation in the world, but soon changed when backpackers started arriving here in the 1970's. Though a great number of the plantations still exist, they are mostly confined to the cool forested hills of the interior. Ko Samui has become a top international destination for tourists turning it into one of the biggest income earners. Here you'll find a modern airport, dozens of luxury hotels, fancy restaurants and world famous beaches. Koh Phangan is home to the full moon and half moon parties. Ask anyone who has been here and they will all tell you that this is the ultimate party island. Ko Phangan is also host to a variety of other parties too, so much so that the island will invent additional ones just to have another great time. It is the perfect refuge if you are seeking more than just fun in the sun. It is the place to be and be seen. It may be rugged and rustic and lacking in alluring beach scenes, but you don't come here to see the beauty, you're here to party. Koh Nang Yuan is a picture perfect group of three tiny Thailand islands positioned just one kilometre north-west of Koh Tao Island. Thanks to a fine white soft sandy causeway, the islands provide unsurpassed and spectacular beach scenery. You can simply relax on the beach, swim and snorkel in the crystal-clear emerald green waters, have a drink at the bar, grab a bite to eat at the restaurant, hike up to a majestic 360-degree viewpoint or just go and explore the magical island. Koh Tao or Turtle Island is so named because it resembles the shape of a turtle nosediving towards Koh Phangan to the south. Once a backpacker's paradise, but now recognised as one of the best locations for scuba diving due to its diverse dive sites all in close proximity to one another. The island is also an excellent spot for bouldering with a number of rock climbing courses being available. The island is a mixture of a dense rugged interior, quiet coves and sweeping shores. This 2 days dive tour for certified divers includes 4 dives and one-night accommodation on Koh Tao is going to be a spectacular adventure. Not only is Koh Tao a "pearl" of the Gulf of Thailand, it's one of the most loved islands in Thailand. On this tour, you'll be able to visit different dive sites around Koh Tao and the Nang Yuan Islands, such as Chumphon Pinnacle, South-West Pinnacle, Shark island as well as two shipwrecks, the HTMS "Sattakut" and the M.V. "Trident". You'll have the comfort of a 20-metre dive boat, perfectly situated for diving and snorkelling. There are two decks on the boat, one dive deck with tanks and compressor and a sun deck for chilling between dives. There is also a closed-off dry area, two freshwater showers and a toilet. 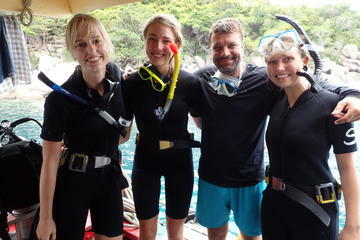 The team onboard are super friendly and are all professional PADI certified dive guides. This is a small-group tour where you'll be able to observe stingrays, octopus, eels on coral reefs in warm waters. Koh Samet is a beautiful island conveniently situated 180 kilometres (108 miles) from Bangkok and only 80 kilometres (48 miles) from Pattaya on the north-east coast of the Gulf of Thailand. Although huge tourist related development began shortly after the island was declared a national park in 1981, this 6-kilometre long island boasts dazzling soft white sandy beaches and sparkling blue waters. Koh Chang is a fabulous getaway island where the sky seems a lot bluer and the air a lot cleaner. You can dive in the cool, clear waters of a number of the island's waterfalls or you can simply relax on one of the numerous pristine beaches. Koh Chang is the second largest island in the country and the principal island of a national marine park archipelago of 52 islands scattered around the Gulf of Thailand. There are virgin rain forests, abundant pristine beaches with fine white sandy shores, two scenic waterfalls and some extremely rare wildlife. Koh Mak Island, also known as Koh Maak Island is a small piece of tropical paradise situated 20 kilometres (12 miles) south of the same archipelago of 52 islands on Koh Chang Island on the eastern shores of Thailand. There are two stunning white sandy beaches complimented by crystal clear waters, lush virgin rainforests, coconut and rubber tree plantations making this a tropical island gem. Koh Mak is truly blessed with several beautiful bays, beaches and untouched colourful coral reefs. It's located to the south of Koh Chang and its local people enjoy a lifestyle via their rubber and coconut tree plantations. 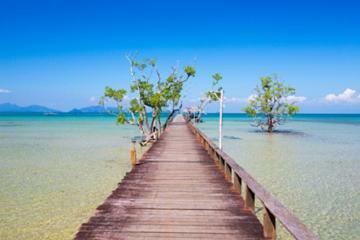 The best time to visit this Thailand island is between November and April. Koh Mak might be off the beaten track but there is plenty of accommodation and tourist facilities available. If you're in the area, why not join us for a 3-day and 2-night tour? Details above. Koh Kham Island is a true tropical treasure paradise belonging in part to the national marine park archipelago of 52 islands set in the Gulf of Thailand and situated approximately 22 kilometres (13 miles) south-east of Hat Bang Bao Bay at the southernmost end of Koh Chang Island. 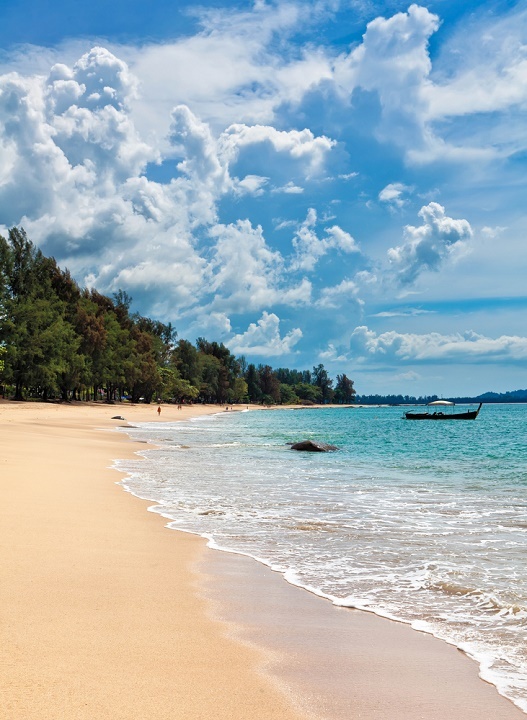 It is also within reasonably easy reach from Ao Suan Yai Beach on the northern shores of Koh Maak Island. 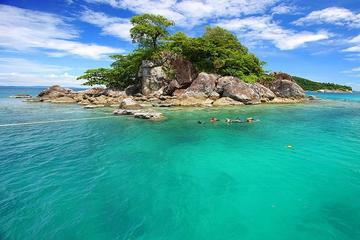 Koh Kood is the fourth largest of the Thailand Islands and the second largest of the 52 island archipelago located on the east coast in the province of Trat. The island lies south of Koh Chang and is considered one of the perfect places for lovers of nature as it retains a somewhat sensual beauty with its natural forested interior. Koh Kood is a utopia not overly affected with commercialization. Koh Kood is the epitome of an island hideaway featuring spacious unique designed bungalow villas, with private terraces and ocean views from almost every room. The resort on this tour offers a full range of recreational activities and facilities and has the largest activity and dive centre on the island. Not only will you be able to enjoy the beauty and peacefulness of the resort but you'll also have everything this natural Thailand island hideaway has to offer. If you can make it, we'd love to have you on this 4-day and 3-night tour.